Explanation: A new rock slab is growing at more than one meter a day on the Mt. St. Helens volcano in Washington, USA. The rock slab, growing since last November, now extends about 100 meters out from one of the volcano's craters. A recently made time lapse movie shows the rock slab growing. 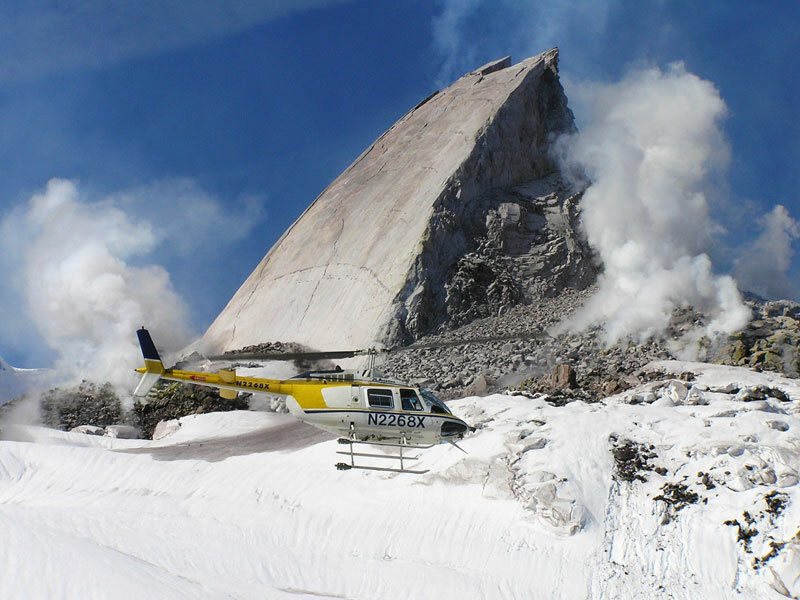 Pictured above, a helicopter examines the steaming hot rock slab late last month. Mt. St. Helens underwent a spectacular eruption in 1980 but has been undergoing a comparatively serene eruption since 2004 September. A new volcanic dome has been building which is now about 100 meters above the 1980s dome. The rock slab is visible from the Johnston Ridge Observatory on the erupting volcano.